Vice President Joe Biden is known for being the punchline of jokes, thanks to his propensity for gaffes. But now the man who spawned a meme genre has embraced his alter ego ‒ Motivational Biden ‒ in a workout video promoting a fitness challenge. Sitting at his desk on the phone, the vice president does arm curls with a 30lb weight. “Yeah, I do a million of these a day. 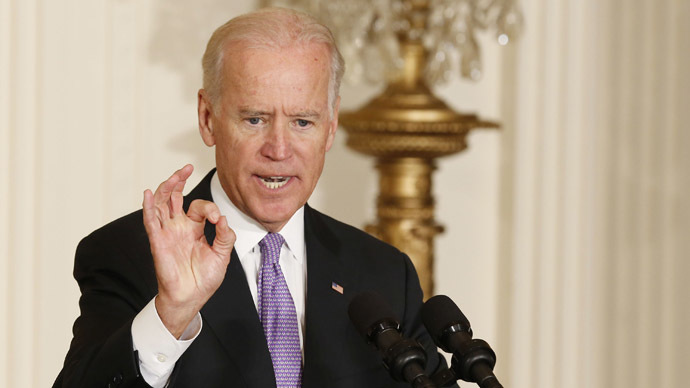 So just give me five,” Biden says in the Vine video published by the White House. The fitness challenge, called #GimmeFive, is in honor of the fifth anniversary of First Lady Michelle Obama’s ‘Let’s Move!’ campaign to fight childhood obesity. In a video of her own to introduce the initiative, the first lady encouraged people to use social media to show five ways they can be more fit and healthy. It’s not the first time that Biden used his motivational prowess to make a workout video. In February 2014, he and President Barack Obama went for a jog around the White House grounds. The first lady has raised some eyebrows with her promotion of #GimmeFive, performing a dance to Mark Ronson’s ‘Uptown Funk’ with Ellen DeGeneres on the comedian’s talk show. The episode will air on Monday. 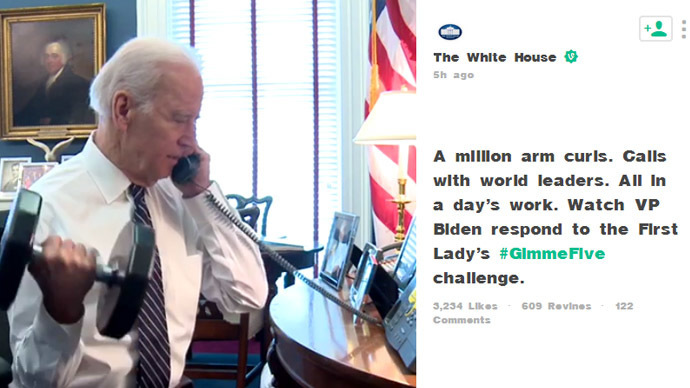 The #GimmeFive initiative has gone viral on social media, thanks to some celebrity help. Basketball star Dwyane Wade, Bravo TV host Andy Cohen, comedian Ricky Gervais, actor Hugh Jackman and music superstar Beyonce all lent their star power to the cause. So did the crew of the International Space Station, led by NASA astronaut Barry Wilmore.
.@FLOTUS Challenge accepted! Watch #AstroButch#GimmeFive somersaults from @Space_Station: [video] http://t.co/FIfMyxA8NS#LetsMove! Long before the latest initiative for the Let’s Move campaign, the first lady and DeGeneres teamed up to promote it. In February 2012, the two women had a push-up contest on the comedian's daytime talk show. Michelle won the competition hands-down. While “Michelle Obama’s arms” might have their own 'Cards Against Humanity' card, the Let’s Move campaign knows that the first lady’s biceps aren’t the only ones invited to the big gun show. Thanks to his “million” reps, ‘Uncle Joe’ Biden ‒ like Saturday Night Live’s Hans and Frans ‒ is here to pump you up. It’s just Biden being Biden, after all.